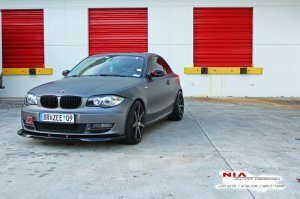 Don't want to mess with the factory design but want to give your 1-series an aggressive stance? The NIA splitter does just that. Bolts right on the bottom of your Factory bumper with 8 screws and 2 rods (all included). Made from ABS Plastic in our Florida factory. Making them Flexible enough to with-stand the common pot holes curve rash, and occasional parking blocks with out breaking. all our Kits are test fitted before leaving our facilities.